It was a sentiment that could also be said of the enthused musical goers who’d stayed on to hear from the creatives after giving a rapturous response to the evening’s sell-out performance. My friend Barry got in with the first audience question of the session: What was it that these American creators saw in the UK production that stood out for them? “The line between the past and the present is the whole concept of this show,” Michael Korie replied, “and I have never seen it so well drawn” as it is in this production, directed by Thom Southerland and produced by Danielle Tarento in their latest collaboration. That’s a snippet of a quote, contained in both the musical and the 1975 documentary film on which it’s based, which is referenced several times during the Q&A. It’s also the opening for a programme note by Scott Frankel explaining the inspiration for and development of Grey Gardens – which I reprint here with permission. Below Scott’s piece, I’ve also gathered my tweets on some of the Q&A highlights. “It’s very difficult to keep the line between the past and the present. I first heard those lines in the mid-1990s. Among my friends, the film Grey Gardens was something of a cultural touchstone. The documentary is a beguiling brew of love, loss, eccentricity, high style and non-conformity that seemed to affect all of us in a very personal way. People would quote lines from the film verbatim. Or even replicate some of Little Edie’s more “creative” costume choices. Seeing the film at midnight screenings, or on worn videocassette copies, I was hooked. It wasn’t until the year 2000, however, that I had the notion to turn Grey Gardens into a musical. Admittedly, it was an offbeat idea. I mean, reclusive cat ladies living in a condemned, decaying twenty-eight room mansion isn’t exactly Guys and Dolls. And a documentary had never been adapted into a stage musical before. Undaunted, I persevered. The story of “Little” Edie Beale and her mother, Edith, seemed very much a tale worth exploring. Each of them were frustrated performers — “Big” Edie was a soprano, her daughter fancied herself a dancer. They both adored the music of the Great American Songbook (Kern, Porter, Berlin, Gershwin, etc. ); perhaps that could help serve as an “engine” to drive the musical. I was eager to have lyricist Michael Korie bring his keen intelligence, empathy and brilliant wordplay to this project. 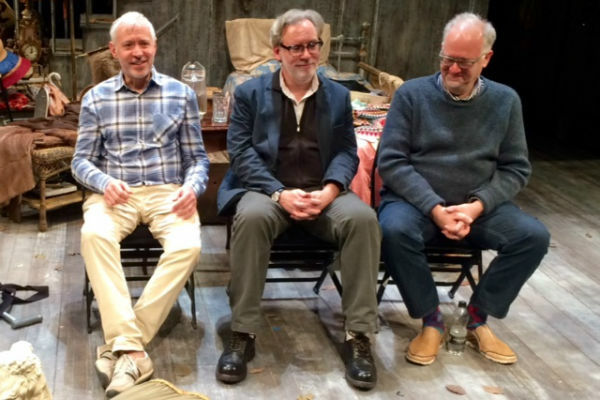 For the book, or libretto, I approached my college classmate Doug Wright, who had written such ambitious and dazzling plays as Quills and the award-winning I Am My Own Wife. I thought that Doug would have the perfect sensibility for translating Grey Gardens to the stage and felt certain that he was most likely already an ardent fan of the film—and he was. But he noted quite correctly that the documentary is more of a character study and less of a narrative-driven work. Was there enough event and plot to make it stageworthy? 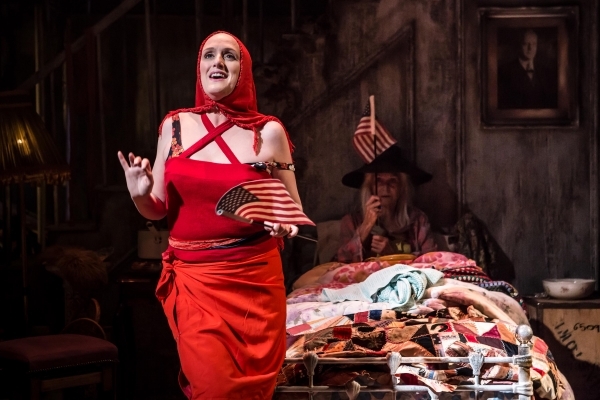 It was at this juncture that we hit upon the notion of creating a first act that was set in 1941, allowing us to see what life was like at Grey Gardens when the house was in its heyday. Because the question that hangs over the documentary is: how could this have happened to these women, especially given their education, wealth, social standing and beauty? Perhaps by investigating the past, we—and the audience— could better understand where they ended up. It also would allow us as authors to flex our stylistic muscles by essaying a first act that had the froth and fun of The Philadelphia Story and High Society, but with darker underpinnings. Doug was now enthusiastically convinced we could make a go of it—and so we began to write. The challenge was to somehow be true to the essence of the Beale women. Pulling us in sometimes opposing directions were concerns that we needed to make the musical work on its own terms, independent of the documentary—it had to connect with an audience of Grey Gardens neophytes. But we were also mindful of not homogenizing it for the legions of aficionados for whom any adaptation was borderline sacrilege. What is it about this tale that fascinates us? When the documentary first came out, Jacqueline Onassis was the most famous woman in the world. So it must have been titillating to learn that she, too, had “unusual” family members hidden away, just like the rest of us. Of course, there was also a hefty dose of schadenfreude: “JACKIE’S KIN LIVING IN FILTH AND SQUALOR!,” screamed the tabloids. Clearly, not even wealth, fame and beauty could make one immune to life’s mishaps and disappointments. But there’s more to it than that. The story of the Beale women is a uniquely American one. Their fierce individuality, style and intelligence remained a constant even as their world—and the world around them—changed. For it is not only the story of this particular mother and daughter, but also the story of the nation. In the 1970s, the Beales’ house was a squalid eyesore in great disrepair, while its inhabitants were steadfast, staunch and true. By contrast, the White House during the Nixon presidency had the outward appearance of propriety and beauty, but was going to rot on the inside. In the end, the ladies became cultural icons—not for their exceptional talent, but for being exceptionally true to themselves. With apologies to F Scott Fitzgerald, not only are there second acts in American lives—there are third acts as well, as those singular lives reach across the Atlantic for the UK premiere production at Southwark. When Albert and his brother first screened the documentary for the ladies, “Little” Edie was reported to have said: “I really wish there was more singing and dancing.” I like to think that we have made some kind of posthumous restitution to that end. I am thrilled by what you wrote about the musical ‘G.G’! My whole life was music and song! It made up for everything! Thrilled-thrilled-thrilled! I have all of mother’s sheet music and her songs that she sang! With all I didn’t have, my life was joyous! p.s. It must be historical! My beloved mother! Edith Ewing Bouvier! 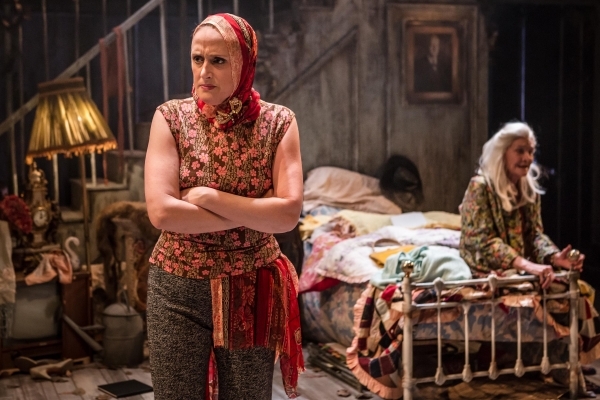 Grey Gardens continues at Southwark Playhouse until 6 February 2016. Although it has sold out, there are four house seats per performance that, if not reserved, will be released at midday each day (5pm the previous day for matinees). There’s also a returns list, which starts selling at the box office at 5.30pm for evening performances, 1pm for matinees in person only.